It does not happen often that we visit the same place twice to spend a holiday. However, we did when we flew to Bali only six months after our first visit last Christmas. Again we rented a house via AIRBNB, but this time it was a little joglo (a traditional wooden house with a large roofed space without walls and an inner section with enclosed bedrooms) in Sanur. Located inside this mature and laid back town a mere 150 meters from the white sandy beaches on the Lombok Strait, an ideal place for us to explore the eastern part of the island. As soon as we left the Denpasar airport we noticed again the Balinese temples and shrines in every street, in front of every house, on parking lots, on the fields. Francien and I saw men and women performing their devotions by putting offerings (flowers and food inside woven square baskets made out of palm or banana leaved to size of a human hand) on walkways, traffic crossings, on the shrines and in front of the richly decorated pura’s (temples), to please their Hindu gods and demons, reminding us how strong the religious believes are for these ever smiling people. Bright white and yellow cloth and small umbrellas were used to decorate the shrines, making everything so colourful against the deep dark blue sky and fresh greenish of the paddy fields, palm trees and huge banyan trees with creepers dropping from the huge branches. Coming from Kuala Lumpur, still shrouded in an unhealthy smog caused by illegal fires started in peatlands and forests on Indonesia's Sumatra island and parts of Borneo, it felt refreshing to say the least! The beaches of Sanur were white and clean and we saw the surf crash on the reef 500 meters off-shore. Not many tourist as most of the endless number of restaurants and terraces cladding the ten kilometers long beach walkway were empty. It was kite season (the wind now blows constantly East to West) and the local youth were flying colourful and up to 5 meter long kites high above the beaches and country sides. I drove two hours by car to the North Bali Sea coastal village of Tulamben. This traditional community is located amid thick forests with the 3000 meter volcano Gunung Agung towering high above. Just 30 meters of the black volcanic pebble beach the USS Liberty ship wreck is one of the most popular scuba diving sites on the island. The WW II wreck was encrusted with colourful corals and indeed teeming with tropic fish. I was fortunate enough to see huge humphead fish! However when diving 21 meters down below looking at a green turtle grazing on the reef, a diver pushed me aside trying to take a selfie with a one meter long selfie-stick of himself and the turtle!! On top of Gunung Batur, 1700 Mtr. The next morning at 03:30 Francien and I started the hike up to the volcano Gunung Batur carrying our bag packs and headlights. We reached the top of the 1770 meter high crest just before sunrise. Our guide boiled fresh eggs and banana’s for breakfast on the steam coming out of cracks of this active volcano (last eruption in 2000). As the sun rose we saw the caldera lake below, the Gunung Agung sticking out of the clouds and the Gunung Rinjani on the island of Lombok on the horizon: a view worth the 700 meter steep and dusty climb! Unfortunately we were not alone on the mountain: an estimated 300 tourists from all corners of the world had joined us on this spectacular place. Scooters easy transportation on busy Island ! 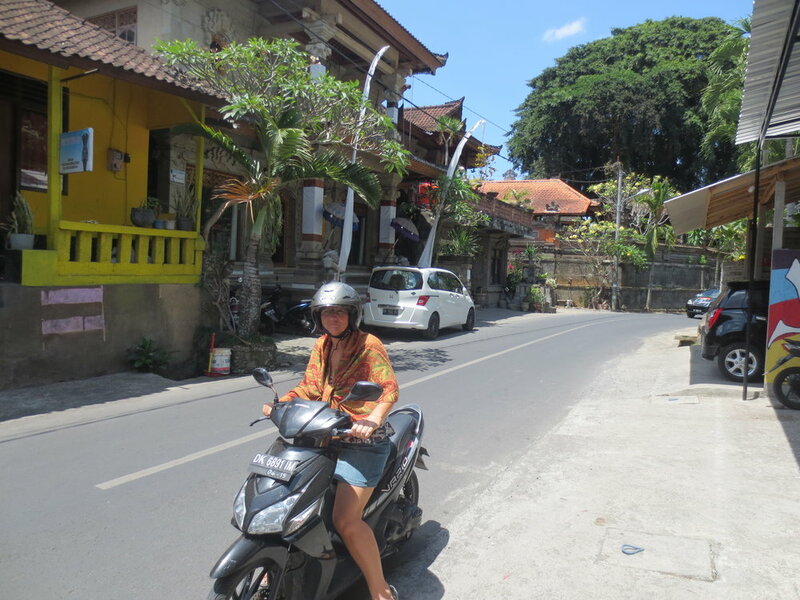 We also rented scooters one day and explored the Ubud region. Traffic was rather chaotic and driving on a scooter means to continuing in your intended direction, using your horn as much as possible to signal that you are there, until someone eventually gives way to you. It helps to forget any previous road rules you have learned! However it came with a great sense of freedom, zipping between cars, trucks, bemos, pedestrians, bicycles and thousands of scooters, being part of the bustling life on the streets. We passed warungs (road-side food stalls where we ate Nasi Goreng and sate, a dish traditionally served also in The Netherlands! ), terraced rice fields and pura’s. In bell-shaped cane baskets roosters were displayed for the local cockfighting which took place during the religious ceremonies. A group of 75 women dressed in bright colored saries sat in the shade preparing offerings for yet another religious ceremony. Feral dogs were everywhere! We stopped in Ubud to drink some refreshments, but this town was just another tourist trap with Western style restaurants, trinkets, tour buses and shows. Hordes of tourists from mainly China, Australia and Japan wielding selfie-sticks walked in the scorching sun from the McDonalds fast food store to Starbucks, ‘taking in the Balinese culture as much as possible’!! On a small road with terraced paddy fields on both sides a few kilometres north of Ubud, a sign demanded RP 10000 for each picture you took from those fields!! The first time we visited the island we stayed in a villa in the middle of the paddy fields away from the touristic sites. 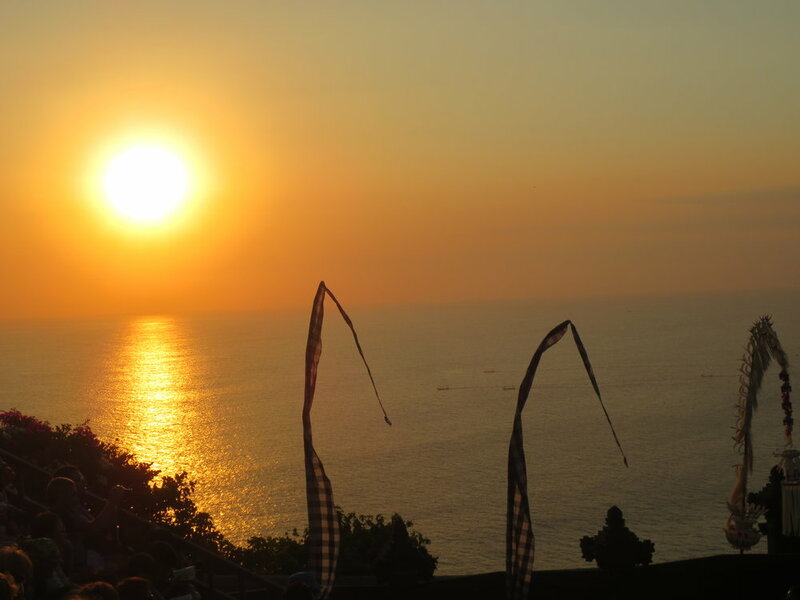 This time around I noticed much more the contrast between the tourist industry which makes up 60 -70 % of the local economy and the deep religious and cultural believes and traditions of the Balinese people themselves. 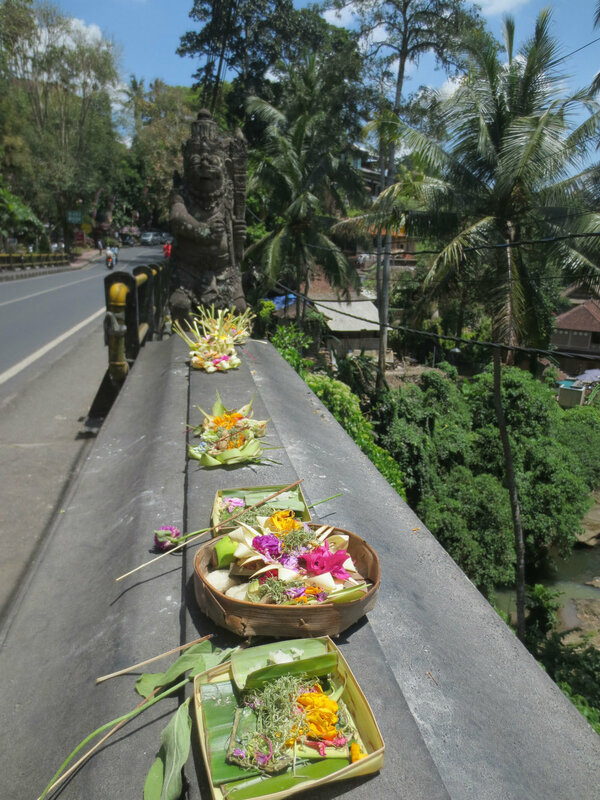 Bali is indeed a beautiful island and Francien and I felt very welcomed at all times, feeling a willingness of our drivers, guides, maids, shopkeepers and people on the street whom we asked for directions to help us whenever possible. The international tourists seemed to respect the many natural resources and authentic culture of Bali as far as we could see, but you wonder how long that will still be the case.